134 • RV PRO • March 2019 rv-pro.com B U S I N E S S Lots of Uncertainty So, we find ourselves in a time when loads of things are uncertain. Govern- ment shutdowns. Stock market volatility. Publicly-traded RV stocks recently get- ting beaten up. Dealership conglomer- ations and private dealership consolida- tions. Whew! It's a lot to think about, isn't it? The RV Industry as an Economic Indicator Maybe you're like me, in that I find it interesting to hear from laymen – those outside our industry – what they think about our business. My next-door neighbor, Ron, asked me recently how the RV business is doing. It seems he has the opinion (and he's not alone in this) that the RV business is a leading economic indicator. In his view, we will be among the first to feel an upturn or downturn in the economy. By the way, he's a great neighbor! That brings another thread of thought to mind: What are the main drivers in our business? Again, from the layman's expressed point of view, he will likely think the price of gas is a big determining factor. Or he may think that interest rates are a key. A 20 Group I moderate once looked at that closely. What we came up with was the insight that our business is driven by what I call "the perception of family wealth" as the key determining factor driving RV purchases. What Really Drives Our Business "The perception of family wealth" is simply this: The impression that a couple has about their future financial well-being. Namely, they look at the availability of discretionary income. And perhaps most importantly, they look at their portfolio: their 401(K), debt load and equity. From that point, they are more or less likely to purchase a big-ticket item like an RV. But it's not the gas prices or the interest rates as many laymen think. It's more to do with feeling financially secure. What Should You Do? 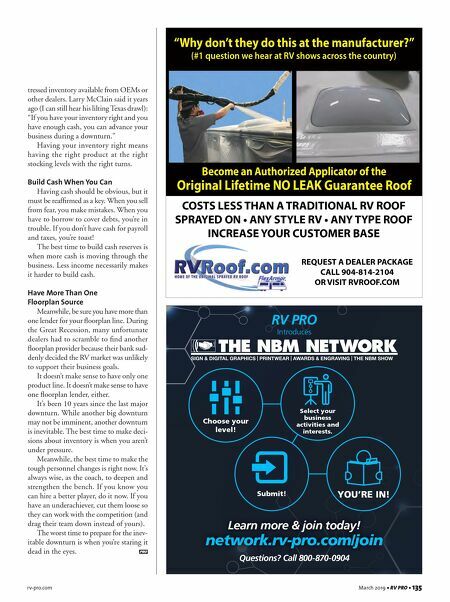 I hope you've read the articles in RV PRO about how other dealers have sur- vived tough times. There are many lessons to learn. It's better, if you are able, to learn from the trials of others in place of having to learn them on your own. I'm specifically talking about things like: What makes a business strong enough to weather the inevitable storms? What do you have to know? How should you think and prepare? So, let's look at the "main things" and ways to protect a dealership during an eventual downturn. Think about the most important items to have fully under control when every else seems to be out of control. I'm talking about personnel, inventory and cash. People Are the Business So much has been said about the importance of personnel. And it is hard to overstate the importance of staffing correctly with the best quality people. In previous columns, I've talked about leadership, mission, vision and culture. So, what becomes important in a downturn? If you have just two strategic charac- teristics in staffing, you'll be far ahead. The first is a cadre of well-trained and dedicated employees. It could be family members. Or, it could be you only think of them as family. But the relationship should be just that close with the folks I'm speaking of. It's that group of people who loyally support the business year over year. It's that group that will be with you as long as the business is open. The second strategic personnel move is to have variable compensation. That is, a comprehensive set of compensation plans that automatically adjust when the business picks up or gets slower. The base pay is the safety net. And the commission or variable component allows your employee to make good money when times are good and OK money when they are not. In either case, in a downturn the staff needs to be com- mitted to weathering the storm. 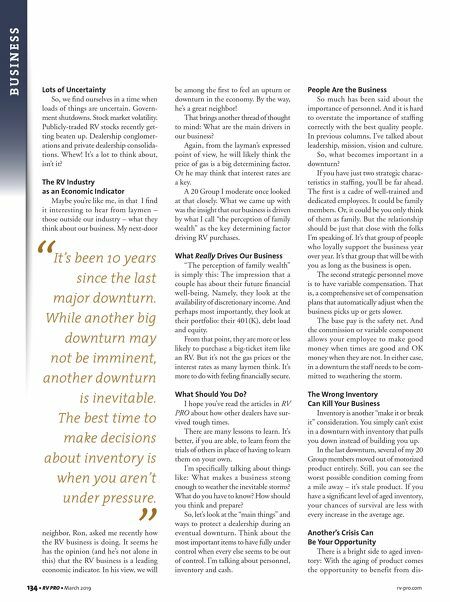 The Wrong Inventory Can Kill Your Business Inventory is another "make it or break it" consideration. You simply can't exist in a downturn with inventory that pulls you down instead of building you up. In the last downturn, several of my 20 Group members moved out of motorized product entirely. Still, you can see the worst possible condition coming from a mile away – it's stale product. If you have a significant level of aged inventory, your chances of survival are less with every increase in the average age. Another's Crisis Can Be Your Opportunity There is a bright side to aged inven- tory: With the aging of product comes the opportunity to benefit from dis- It's been 10 years since the last major downturn. While another big downturn may not be imminent, another downturn is inevitable. The best time to make decisions about inventory is when you aren't under pressure. " "